Circulon continues to refine their cookware offerings with another variety of hard-anodized aluminum pan sets. 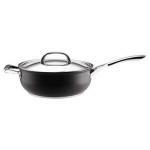 The Elite Cookware set includes six pans with the proprietary nonstick finish, plus four stainless steel and glass fitted lids. 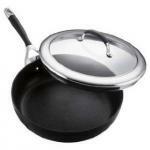 This pan comes with the patented TOTAL Hard-Anodized Hi-Low Food Release System. What does this mean to you? 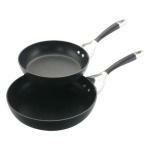 That the company guarantees the non-stick surface will outlast all other non-sticks. I believe one of the best characteristics is the non-stick outside.